Lens Leica Summilux 28 mm f/1.7 ASPH., 11 elements in 9 groups, 3 aspherical elements. approx. 1.8 x (corresponds to focal length of 50 mm). Image stabilization Optical compensation system for photo and video recordings. Aperture range 1.7 to 16 in 1⁄3 EV increments. CMOS sensor, 26.3/24.2 million pixels (total/effective). Dynamic range 13 aperture stops. Photo capture format Selectable: DNG + JPEG, JPEG. megapixels (2976 × 1984 pixels), megapixels (1600 × 1080 pixels). megapixels (2384 × 1592 pixels), megapixels (1280 × 856 pixels). megapixels (1680 × 1120 pixels), megapixels (896 × 600 pixels). FHD: 1920 x 1080 p with 60 or 30 fps. HD: 1280 x 720 p with 30 fps. Storage media SD/SDHC/SDXC, multimedia cards, speed class: UHS-1. ISO range Automatic, ISO 100 to ISO 50000.
measuring, manual color temperature setting. Color space Selectable for photos: sRGB, Adobe® RGB, ECI RGB, for videos: sRGB. Each selectable in 5 steps, also available as option in saturation . Focusing range 30 cm to ∞, with macro setting from 17 cm. Autofocus system Contrast-based autofocus system. miniature effect, panorama, time lapse. Exposure compensation ±3 EV in 1⁄3 EV increments. Automatic bracketing Three exposures in graduations of up to 3 EV, can be set in 1⁄3 EV increments. Shutter type Mechanical and electronical. flash synchronization up to 1⁄500 s.
Picture series Selectable: 10/5/3 fps (H/M/L). Self-timer Delay time either 2 s or 12 s.
eyepiece: ±3 diopters, with eye sensor for automatic switching between viewfinder and monitor. Monitor 3" TFT LCD monitor with approx. 1,040,000 pixels, touch control possible. encryption method: WLAN-compatible WPA™/ WPA2™, access method: infrastructure mode. NFC According to JIS X 6319-4 standard/13.56 MHz. Connections Micro USB socket (2.0), HDMI socket. Power supply Leica BP-DC12 lithium ion battery, rated voltage 7.2 V DC, capacity: 1200 mAh. 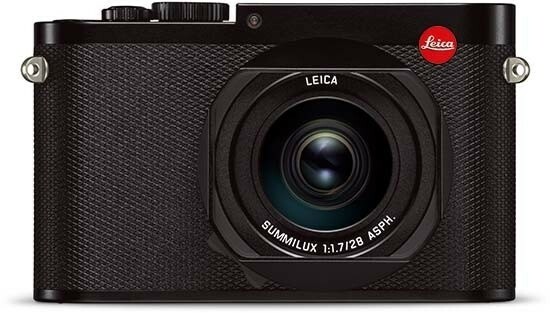 Charger Leica BC-DC12, input: 100–240 V AC, 50/60 Hz, automatic switching, output: 8.4 V DC; 0.65 A.
ISO accessory shoe with center and control contacts to connect flash units, such as the Leica SF26. Tripod thread A 1/4 DIN 4503 (1/4"). Weight Approx. 590/640 g / 20.8/22.6 oz. (without/with battery). power cable (EU, US, local power cable), USB cable. (free download remote control and picture transfer in Apple® App-Store®/Google® Play Store®).